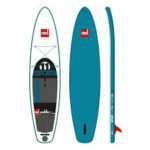 Note: You currently get a free 3-piece fiberglass paddle worth $159 when you buy a board at PumpedUpSUP.com. Why wouldn’t you want to know about the Red Paddle Co Sport? It’s the decadent choice of all SUPs. The touring SUP that leaves you drooling and only being able to fantasize about it there on after. Which is why it was named number #1 Touring SUP for 2018 in our Best Inflatables article. 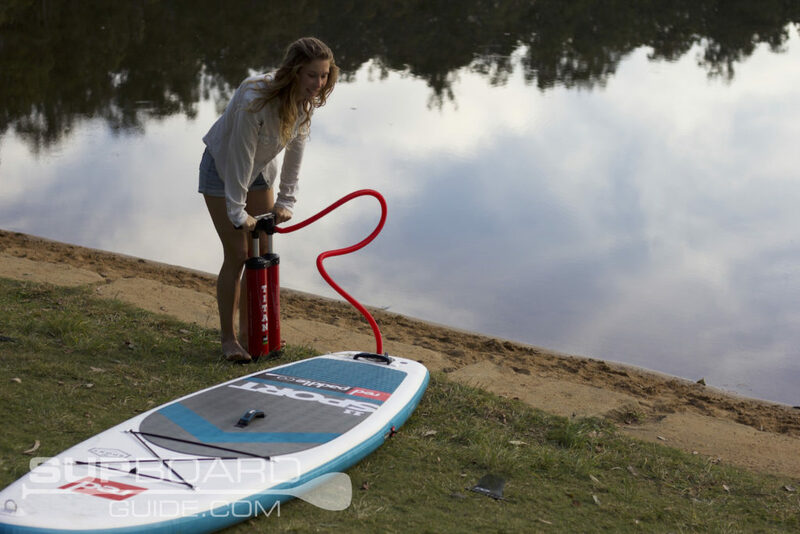 Red Paddle Co is the world’s most popular inflatable paddle board company, and the expectations are high when you test any of their boards. 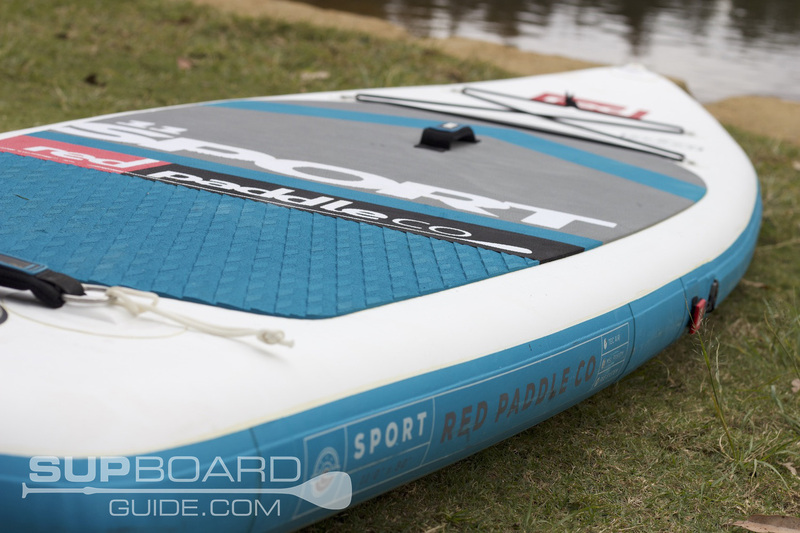 I feel very lucky to have got to review the 11′ Red Paddle Co Sport, and it was obvious the second I got on board why people love these boards so much. Read on to find out what all the hype is about. When a board crosses your path to be reviewed with a name like Red Paddle Co on it, it’s hard to not set your expectations high. I do try my hardest to ignore a brand’s name and go in unbiased, but there is more hype about Red Paddle Co than any other brand in inflatables. 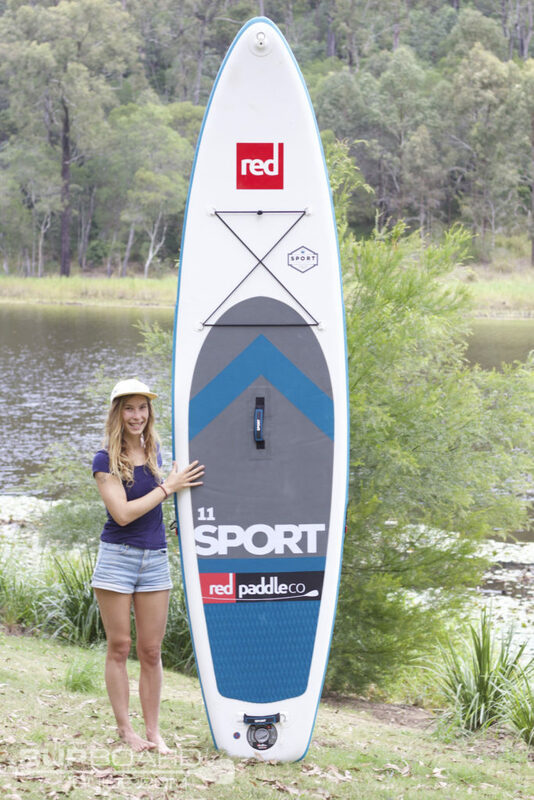 The 11 Sport from Red is so much fun to paddle. It’s fast but stable, and it’s not too thick, so you feel more in touch with the maneuverability of the board. For a single fin, it turns impressively and of course, tracks brilliantly. Taking my friend out as well as being the co-pilot myself, it held its shape as well speed and performance. I’m putting this down to it’s RSS stiffening system through the rails. They advertise that it helps to maintain an even distribution of weight across the board which in turn adds to stability and rigidness, even under lots of weight. I believe that they have advertised correctly! 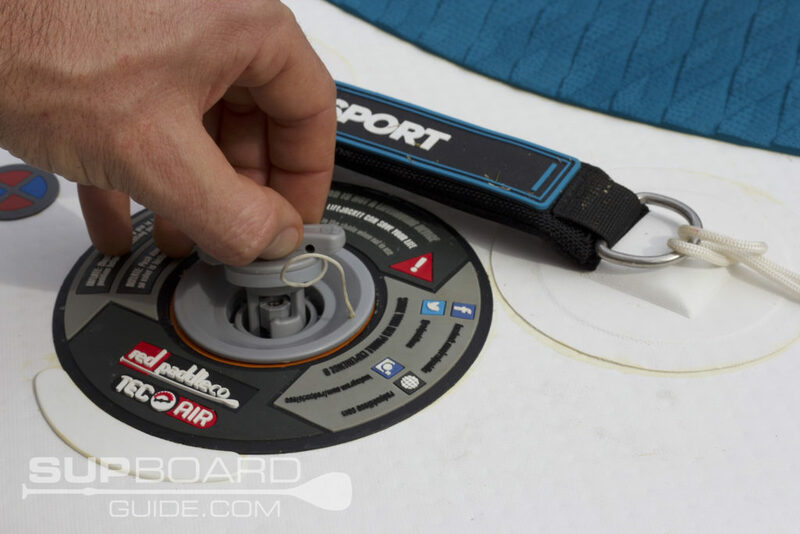 It performs better in a bit of wind and chop (which I did encounter on the second use of this board) than many other inflatables such as iRockers range, that has gone with the 6” thickness. So far in my time reviewing, only Red, ERS, and Baysports have done their boards justice with the 5” thickness. That little bit less buoyancy turns your SUP from being a tumbleweed on water into something you can actually manage. I’m all for an extra workout here and there but as a regular paddler who lives near the coast, fighting the wind can get kind of old. Going more into the performance, the tracking is superb. I know I said that already. But it really is. It’s especially a blessing for those who are just starting out to not have to try master a straight line. The center fin is an FCS hatchet fin that is specifically designed for narrowing down on straight lines. This kind of fin can be found on many old-school noserider longboards, for the same reason. You can imagine how wobbly it gets once you’re up on the nose on a 9’ board, so then you can imagine how stable it is when you’re not, and you have that same fin in! Being a US fin box system means you can also change your fins out for other FCS fins, therefore, changing your performance a little too. Getting a smaller fin will give you tighter turns as well protecting the fin box and fin in shallower waters. Stability on board for me was above average. I’m also a little person in most situations. So, that’s why I always convince someone to come along and go for a paddle too. Friends who were complete beginners were up and off after only a few minutes of gaining their confidence. However, it’s not quite as stable as other inflatable SUPs like the iRockers, and Thursosurfto name a few. Only because these pre mentioned SUPs all have loads more buoyancy throughout with an extra inch of thickness as well a more rounded shape. Now, the downside here is that they lack the same speed and performance that the 11’ Sport offers. 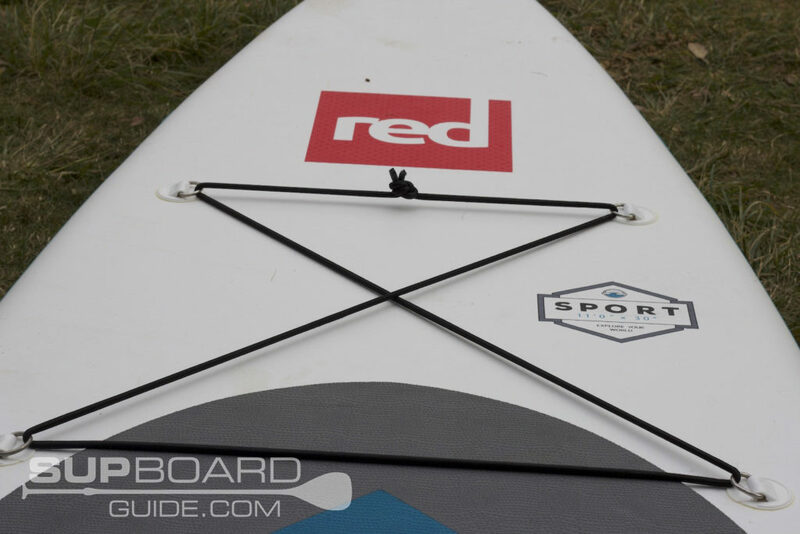 It doesn’t take long to get to used to a little less volume, and the pay off is great, so if you can afford to be shopping in this higher bracket of boards for a touring SUP, then the Red Paddle Co Sport really is a brilliant option. So brilliant it made it into our #1 Touring inflatable SUP for 2018! Here is where I explain part of why I believe Red is so successful. They produce boards that are lightweight but still durable as well as feeling on par with a hardboard. Introducing Red’s own manufacturing process called MSL Fusion. If you want to get into the real nitty-gritty of this technology, head over to their HQ and absorb yourself in their explanation. A layman’s explanation would go as follows. You create the inner threaded section by using a process referred to as drop-stitching. This is the first stage of making any inflatable SUP capable of being inflated to high pressures to produce that hardboard feeling. Then this is where a twist starts to play out. Other inflatable SUP’s would coat this inner section in a layer of PVC then glue additional layers together. Red coats this section in a layer of sealing and bonding adhesive then machine fuses, not glues, a layer of PVC to it. The result comes in two forms. The weight difference and aesthetics. Where on others boards we’ve had to put out bubbles *cough Aqua Marina cough*, on Reds products you get a smooth finish from nose to tail. The difference in weight is because with gluing, you have to do many layers for the same durability and rigidness you get from fusing. So fusing drops the need for these multiples layers, which literally sheds kgs off your board. Now you have a brilliant shiny board, all that’s left is some nice pretty logos, a deck pad, and features. The features and design I comment on further below, but the deck pad I will mention now. Their machine presses the deck pads on at 170 PSI, which is hard to imagine what that looks like considering what inflation pressures feel like at 15 PSI. This hybrid deck pad features crocodile skin for comfort where you would stand when leisurely paddling and diamond deck pad at the back for increase in traction whilst back foot down turning. 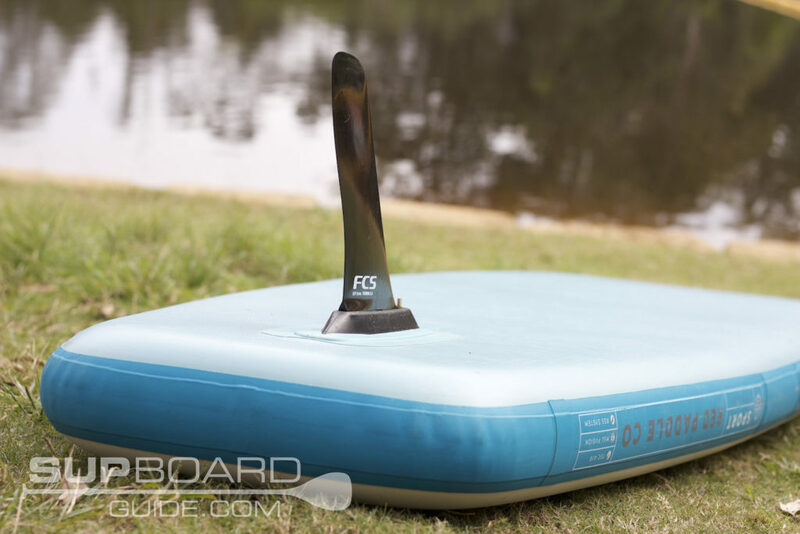 One 9” FCS fin can be found on the bottom of your board. The US fin box in which it nestles in is compatible with a range of other FCS fins too. Totally ideal for shallower waters in which your fin may be prone to damage. This style of hatchet fin provides superb tracking as well as maneuverability. The shape itself is what keeps you on point to your destination while the quality thinner sturdy plastic helps with its ability to turn your SUP. Never have I ever actually opted to use a hand pump over my electric. Until now. The Titan pump is something to be put on a pedestal and exalted for years to come. I will explain why further on in the accessories. But for now all you need to know is the inflate will only bring smiles, no tears here on out. It’s a fraction of the time of any other pump, even other double chambers. Deflate is much the same as others, twist and turn your pin, either get that last bit of air out with the “deflate” option or keep the pin pushed down as roll to let the air escape. 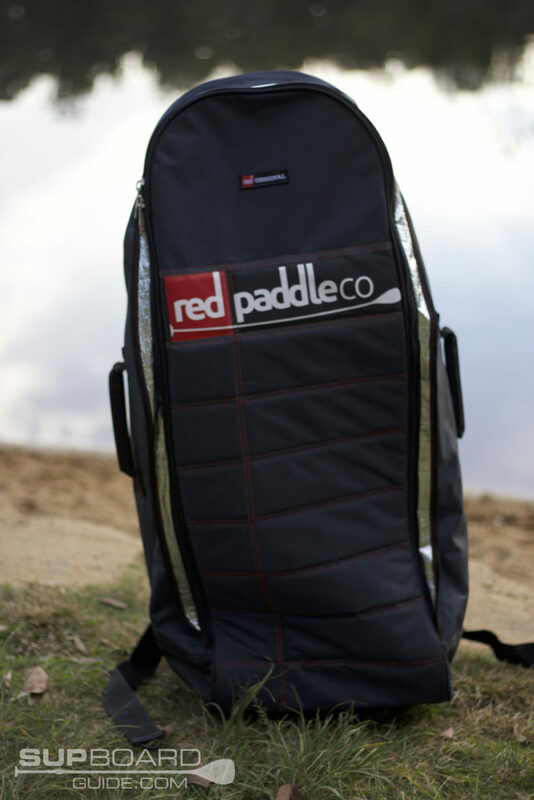 Starting with aesthetics, the Red Paddle Co Sport has simple but nice color scheme. They have stuck with this same theme all the way through their series, excluding a few special release boards. It makes it super easy to pick out a Red board on the water. Their logo and prints are sharp, suggesting a good print! 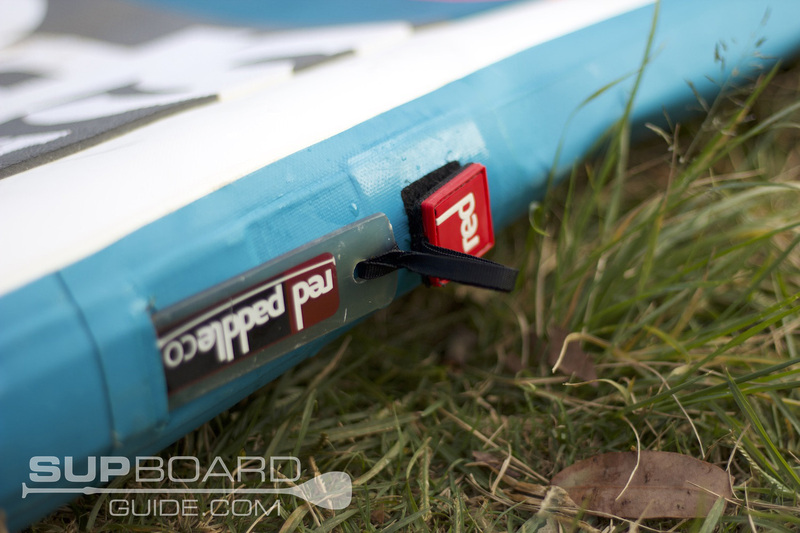 Looking at the design of the actual board itself, you’ll notice a squared-off tail and tapered nose. Some touring boards are verging on being racers, prioritizing speed over stability. But this narrows down the customers who will feel confident to use it. The Sport has combined speed with the streamline midsection to a tapered nose and also stability with the squared tail. Meeting beautifully in the middle of this combination and then enhancing your glide again with quality materials! Then, of course, the RSS stiffening system I mentioned in the performance. These batons slide in prior to inflation and make the board super solid all the way through. Not only does it increase rigidness )which adds to stability) it also aids a little in a tighter turn. The part I’ve been so excited to tell you about. 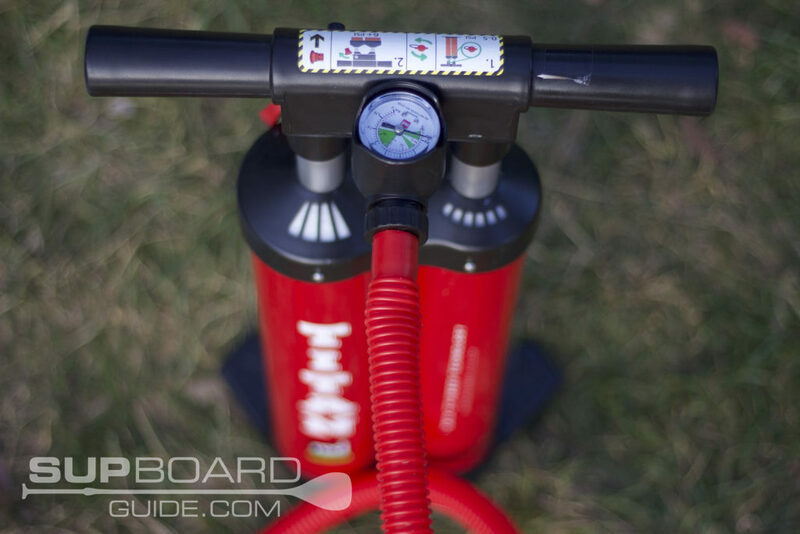 The Red Paddle Co Titan Pump! This dual chamber, high pressure, dual action wonderous piece of engineering changed my perspective on hand pumps drastically. Like a good reviewer, I do try pumping boards by hand to get a feel of the pump. Though after I’ve done it once, I have to admit I only ever use my electric pump there on out. The only problem is sometimes I’m not launching near my car, or I’m parked in an area with not much room to inflate my board. In those moments here on out, I will always have a Titan nearby. I can not simply express the difference in inflation time and ease of effort this pump provides. I think it was potentially quicker to inflate the Sport by hand even. By the time I put my electric pump together and get it attached to my car battery (I have a van, not so easy to get to), plug her in and press “on”. I was probably up to high-pressure part of pumping by hand. Rolling in all fresh and suave is the 2018 backpack/travel bag. It’s got a ton of features, all of which are useful and practical! Really, there is not much I can fault here. That’s a totally honest statement. There are small preferences like more storage area and handles, but that’s about it. Red Paddle Co produces all their SUPs in their own factory, keeping a close eye under production constantly. The result is a consistent product that is durable and carefully thought out from the inner core to the strap clips. 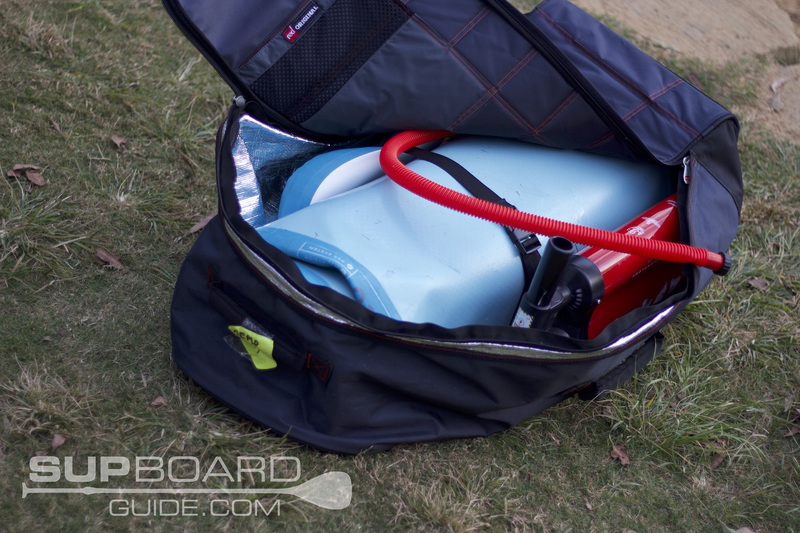 As far as performance goes in inflatables, you can’t beat Red’s boards either. Hardboards will generally have it over inflatables in performance until technology improves and we can be sure Red will be the first to take that prize. The cost price of these SUPs definitely matches their quality in both manufacturing materials and process but also in accessories. Especially that pump, oh that pump, it’s ruined me. If you are looking for something that will give you the absolute most out of a touring session on the water, be taking a close look at this Sport. For those who can’t find any more loose change for the cause, next in line for a touring SUP we’d be suggesting Thursosurf Expedition. There is also a range of other sizes for the Red Sport so if it’s extra weight or stability you need, be sure to check them out. You can choose from this 11″, 11’3″, and the 12’6″. If you’re interested in buying the board make sure you check out PumpedUpSUP.com to receive a free paddle worth $159. Great review! Is the purple board in pic the red paddle 2018 Special Edition 10.6? If so, would love to hear your opinion on that one too… Thanks for your help.. It is. Good eye 🙂 We’re publishing the full review of the SE 10’6″ later today. I will share the link here as soon as it’s live. Here you go 🙂 Hope you like it! Let me know if you have any questions we didn’t answer in the review! The Sport is definitely way better for distance. It’s super fun and speedy as well as being so stable. I’m not sure how it’d go in waves, maybe small waves that don’t break straight onto a shore. If you were to surf it, I would surf it with keeping longboarding in mind. So, wherever you may surf a longboard you could potentially get away with it. Actually just thinking about it, did surf this once on a point break, it did okay, bit slow to turn so definitely want a soft rolling wave. I would think the Sport is probably a better option if long distances are going to be your preference. All comments have to be approved before being posted (Let’s us catch the scammers!). I see you’ve replied a few times probably thinking it hasn’t gone through. I’ll just reply to this one comment. It is much faster, due to its shape and also fin setup. The Ride is very responsive which is great! But for touring the tracking isn’t comparable to the Sport. As it’s a US fin box you can also buy a lower profile fin that will fit the Sport if you are worried about the size. The Ride is the all-around, it’s diverse so it can suit lots of type of waters. A “jack of all trades”. Whereas the Sport is definitely made to excel as a touring board so speed will always be an important factor. Awesome! It’s never too late to start paddle boarding. Let us know how you like the Red! It’s definitely the better choice than the Zray.